If the fan system of your notebook gets too dusty, the ventilator cannot dissipate heat. Your notebook cannot work properly and the emerging overheat will cause serious damages. If your notebook gets too hot it doesn't say that it will not work. But if you dont mind the cleaning of your fan the emerging overheat could cause some defects. You can avoid this by letting us clean your fan at a reasonable price. You will quickly notice how quiet your device runs afterwards. In order for your notebook to work properly and not to break down due to a lack of cleaning of the fan, you should keep the fan in mind and care for a professional fan cleaning. This will stop the fan from loud operating noise and emerging overheat, which can quickly lead to failure of your device. 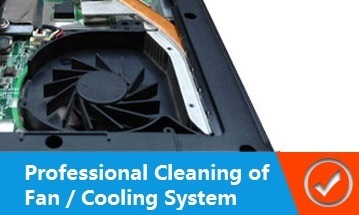 We clean the fan so you already can use your notebook within the same day and to be capable to operate as usual. Since the cleaning of a notebook is not easy you leave us with the task and benefit from a service which convinces with competence and fair conditions. If your device is already running with very loud noise and has to work very hard during the cooling of the notebook it's definitely time to choose a cleaning. We realize your order, without you having to accept high costs or long waiting periods.